Cooper Wiring Device Straight blade power receptacle has glass reinforced nylon construction for durability. 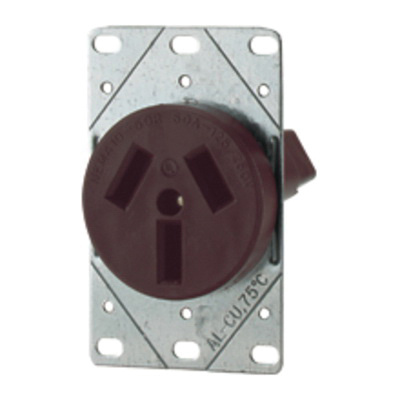 The flush-mount receptacle in brown color, has heavy gauge galvanized steel strap. This 3-Pole, 3-Wire receptacle has a voltage rating of 125/250-Volts AC and current rating of 50-Amps. The NEMA 10-50R rated receptacle has bottom/back-wired terminals and is compatible with 4-AWG wire. It is suitable for commercial/specification, high amperage industrial power connectivity applications. The straight blade duplex receptacle meets UL, NOM, NAFTA and RoHS standards.